All About Potassium Iodide – In-depth information on FDA Approved Potassium Iodide for radiation emergencies. Potassium Iodide vs Potassium Iodate – Why Potassium Iodide is superior to Potassium Iodate. Answered: How Much Potassium Iodide Should You Stockpile? Nuclear Reactor ZIP CODE Locator – Find your nearest reactor by zipcode. 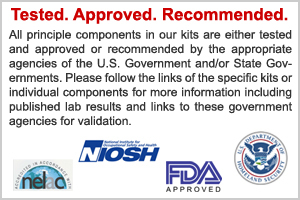 Buy Iosat™ Potassium Iodide tablets – FDA Approved for nuclear radiation emergencies. ☢ RADTriage Radiation Detector – Discreet radiation detection. Fits in your wallet. Dirty Bomb Emergency Kits – Specific to radiation likely found in a Dirty Bomb. Radiation Protection – Protecting yourself from Nuclear and Dirty Bomb Radiation. There is a difference. Radiacwash™ (nuclear and dirty bomb) – Used for both Nuclear and Dirty Bomb radiation. Iodowash™ (nuclear specific) – Decontaminates radioactive iodine I-131. Radiacwash™ Towelettes – 20 Pack – Small. Individually packaged. Use on hands and small objects. Radiacwash™ Towelettes – 50 Pack – Small. Individually packaged. Use on hands and small objects. Radiacwash™ Towelettes – 100 pack – Small. Individually packaged. Use on hands and small objects. ☢ Iodowash Radiaton Decontamination – 8oz bottle (one) – Use for Radioactive Iodine (Nuclear) decontamination of skin and surfaces. ☢ Iodowash Decontamination Solutions – (six) 8oz bottles – Case price. ☢ Rad-Bio Waste Bag – Disposal of contaminated clothing and gear. ☢ Radiation-Wipes™ – Plastic-backed RAD-Wipes™ clean up decontamination solutions. Our basic radiation protection kit for a family includes potassium iodide for up to 4 people during a nuclear radiation emergency such as Fukushima or fallout from a nuclear bomb. Our standard protection kit for a family includes potassium iodide for up to 4 people during a nuclear radiation emergency such as Fukushima or fallout from a nuclear bomb. 1 Radiological Water Filtration Straw – Filters radioisotopes from fresh water drinking supplies. 1 8 oz Radiacwash Spray Mist bottle for radioactive iodine decontamination. 10 Radiation-Wipes for radiation decontamination. Used with Iodowash. 1 Rad-Waste bag for disposal of contaminated wipes, gloves and clothing. 4 N95 Particulate Face Masks for blocking inhalation of certain alpha and low-energy beta particles. 1 RADTriage Radiation Detector instantly detects radiation. Fits in wallet. Great kit. Has everything I need and packed very professionally. For over 18 years, we've accepted payments with Authorize.net, a secure payment processor used by millions of shoppers. © 2018 Nukepills Inc. All rights reserved. This website is powered by Nuclear Fission.